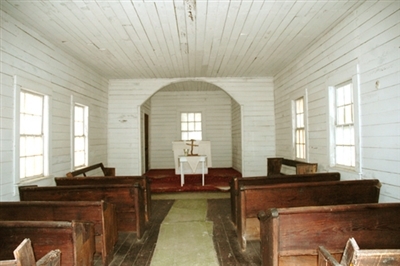 First African Baptist Church, Cumberland Island, GA. Courtesy National Park Service. Partnerships. Small churches often have no choice but to partner with others to carry out ministry, and partnerships, if done well, can result in exponentially greater impact in the community. You aren’t limited to the gifts and perspective within your own congregation; you can seek others who make up the other half of what you don’t have. Particularly when working on complex community issues when all kinds of people, expertise, connections, and resources are needed to move forward, the small church can truly shine as one piece of a more complex partnership puzzle. Recently, I worked with several smaller churches that were developing partnerships with public schools. We started with a goal of recruiting just ten volunteers from each church, and they met that goal. Next people from the church started going into the school every week, learning about the needs of students, interacting with teachers and other staff, and making an impact by being faithful. A small group of people who are willing to keep at it can make a big difference! Ownership. In a small church, members may also feel a greater sense of ownership for the ministry. Without many paid staff, it is up to church members to develop the vision and the plan, find partners, and enlist other church members to get involved. You can’t just look around and say, “Pastor So-and-So is going to do that.” In a small church, when you look around, you might only see yourself and a few of your friends. If you don’t do it, no one else will! This strong ownership by lay leaders can help ministry be sustainable over the long term, long after paid staff members have moved on. Small churches are all too aware of the challenges facing their ministries — the limited funds, only a small number of church members, and a building that needs work. But even in the face of such challenges, your small church may be able to start some very powerful community ministries. Take stock of what you do have rather than what you don’t have, and build on those assets. Be creative about finding partners, raising money, and securing in-kind donations. And most importantly, keep going. Some of the most successful community ministries programs are small and focused and don’t require lots of money and people. Courtesy of the Lewis Center for Church Leadership www.churchleadership.com/leadingideas. The opinions are those of the author and do not necessarily reflect the policy or positon of the Florida Conference.